It's not much, but I've got 4 Tractor supply Rhode Island Reds in there at present. Started with 5. Using a large tote I already had that was empty. 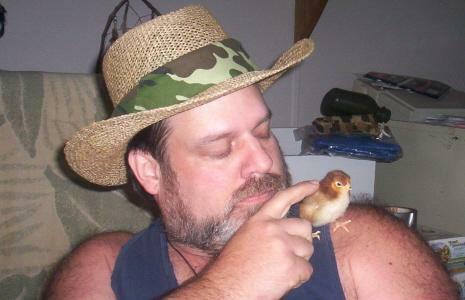 And one of me and "Bull" the RIR Rooster, (RIP) he died two days later Don't know why. Ashria, Rickwar04 and chickenmeadow like this. Simple to use set up. Nice to see not too large a bulb being used for this kind of small brooder. Artilce does not have details on modifying the tote for brooder use. The lid needs vents and protection protection from indoor predators--like cats! This is the same set up we're using, with a wire top, I bought little feeder & water units. I've taken care of my step-daughter's chicks in their tote brooder while they were on vacation for 10 days, (and nobody died!) and noticed the feed/water units got pushed over often. So I'm going to try hanging the feed/water units from the wire top, its a heavy gauge wire, by a single wire so they can't hang themselves, and low enough that they can easily reach in. I have a 2nd brooder tote to use in which I will transfer everything to that tote when it's time to clean the dirty tote, and just alternate them. I thought this was the best way to clean. They're arriving tomorrow (a day early), but I'm ready! 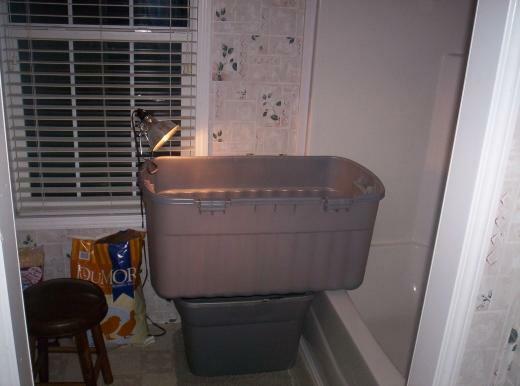 Totes make a great brooder, inexpensive, quick to put together, easy to sanitize, stack a few together when done using, keeps drafts from coming in at the sides, heat lamp clamps on top easy, ....... It's good thinking to use what you have. 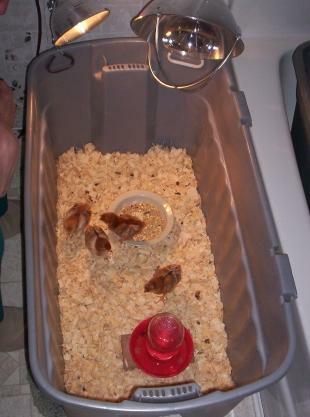 I have clear totes, so the chicks are used to seeing me & come running my way for pets or treats; & see other activity around, also a lid of some small holed fencing (I use 1/4" or 1/2" hardware cloth with duct tape on edges so I don't get scratched, then fold the two ends down 2" or 3" to help keep in place), the lid will keep them from jumping out to be injured & if the heat lamp was to mysteriously fall in, the fencing would catch it. Have never had the heat lamp melt the plastic tote. I even made a small cutout in the end of one tote & taped a second tote to it as an extension as they get a little older & need more space (the second tote has one end cut off that will slide right up to & past the cutout tote end to be temporarily taped on the outside). Have fun with your chickies! CountryChic63 and Rickwar04 like this. Been thinking about building one.. but time is always in short supply so I'm sold on this! I'm getting 4 RReds tomorrow! Awesome - this is what we'll be using too! this is how I am doing mine how far away from chicks does light have to be and is there any fear of melting bin with light or wood shavings catching fire? We've used these for quite a while now, although we made a wood frame that fits around the outside, then covered it with wire. When we feel energetic, we even make a little door in the wire- it makes it easier to get feed and water in. We had to cover ours- the cats were just too interested! I usually start out my chicks in the laundry room, especially in really cold weather, then move them to the garage after a few days. 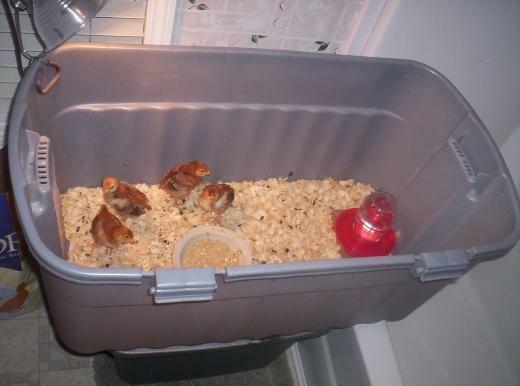 I've put 20 or so chicks in a large container initially- have to split them up as they grow,. Great idea for us "Newbies" I have it all here THANKS Sorry to hear about your little Rooster buddy !! This is what i have use. Works great easy clean. I suggest a little chicken wire on top. I had gone into the room to find a few perched on the sides of the tote haha. This is the route Im planning on to, I already have everything but the lamp and food/water. One main reason is Im building my own coop and want to put the extras in that if I can safely minimize this stage. exactly what im going to be using!! wonderful idea!! I have used this one too, with baby gate on top to keep cats out! Sounds easy and simple!Cant wait to try it out! i like this one , i have been searching for a cheap and easy brooder . i have been wanting chicks for a while, how many chicks does this one hold? i'm going to get 3 or 4!!!! Done this many many times. Only flaw is in 3 weeks your gonna need either A a larger one or B a roof of some sort. If u have a small number of chicks. Just get a covering. I used some wire shelving and just laid it on top. I'm using a similar set up. I thought everything was fine and walked into the room and one of my chicks was up on the edge. I immediately made a cover with chicken wire bent around the edges. It seems to be working pretty well. Re: your rooster... I have heard that sometimes chicks can have a poor reaction to pine shavings... something about the fumes. I myself use newspaper on the bottom of my brooders. Thanks for the idea!! saves me building something all over again !! This is my set up too. And when they get bigger and start to try and fly I use an old baby gate on top to keep them in until they are old enough to go out side. Nice! Thanks for taking the photos to share! How old will they be when they out grow this type of brooder? This is what I use. Quick, simple, and easy to clean.